Picture your organization (and your supply chain) as a ship navigating down a river. 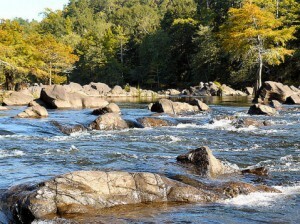 The river represents your business environment – flowing fast with rocks below the water that can puncture the hull. The rocks are problems and wastes (excessive inventories, transportation, space, time, packaging, work and rework) and the water level is inventory throughout the supply chain that hides the rocks. Navigate around the rocks, relying on managers to constantly change course (firefighting). Raise the water level (inventory) to float freely over all of the rocks. Expose and eliminate the rocks permanently, so the ship can sail safely and with less water (inventory) to its destination (your customers). Supplier deliveries are unreliable, so they add safety stock to gain a sense of security. Transportation lead times are erratic, so they add buffer stocks in order to cover variability in lead times. Communication with customers is lacking, so they hedge against demand uncertainties and raise finished-goods inventory levels. Inventory only hides these problems. Your company can continue to ignore problems and supply chain waste (rocks below the water) and raise the water level (inventory). But eventually excessive inventory will result in a highly inefficient company with uncontrolled internal costs (a boat out of control and thrown over the river’s edge by high water). The goal is to gradually create a river that is calm and navigable, removing water slowly to expose rocks without hitting them, and then address each rock (problem) with lean tools to remove them permanently. Summarized from the workbook Building a Lean Fulfillment Stream written by Robert O. Martichenko and Kevin von Grabe.